Of the 56 men that signed the Declaration of Independence, it appears that only nine were Freemasons, or masons with verifiable records of association. While the nature of the declaration is consistent with the ideas of Freemasonry, it seems a stretch to think that the fraternity influenced directly the creation of the document. It is, however, likely that as the ideas of the freedom, independence, liberty, equality (and perhaps fraternity) were at hand in it’s creation and quite possibly included as its framers may have had these associations in their subconscious considerations. 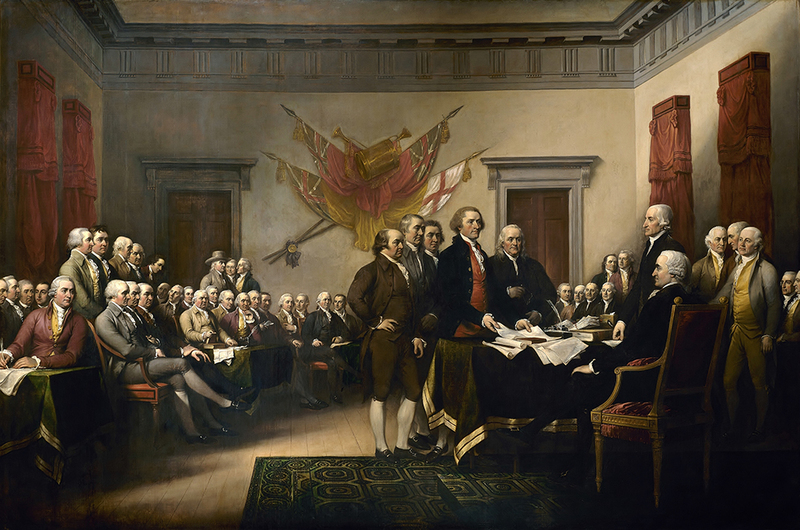 Whatever the case, these men and the 47 others who penned their name to this document, had the foresight of a brave and uniquely free country. William Ellery was the son of a successful merchant and politician in Newport, Rhode Island. Like his father, Ellery attended Harvard, graduating in 1747 and later engaging in business and practicing law in Newport in 1770. Ellery was an influential member in the Continental Congress in 1776. As a signer, his signature on the Declaration of Independence was second in size to John Hancock’s famous signature. He went on to be a signer the Articles of Confederation. American statesman, scientist, philosopher and author, Franklin began his career as an apprenticed to his brother, James, a printer, when only 12. Five years later, he left the employment of his brother over disagreements, settling in Philadelphia where he was first employed as a printer then the proprietor of a printing business and publishing The Pennsylvania Gazette, 1730-48 and gained wide recognition with his Poor Richard’s Almanack, 1732-57. In 1727 he organized the “Junto” club which became the American Philosophical Society, and in 1731 laid the foundations for a library which developed into the Philadelphia Public Library. He was instrumental in improving the lighting of city streets, invented a heating stove about 1744 (which is still being made), and, becoming interested in electricity. In 1748 he sold his business to the foreman and retired to devote himself to public life. In 1754, Benjamin Franklin the was Pennsylvania delegate to the Albany Congress and from 1757-62 was in England representing nascent state in efforts to enforce taxes on proprietary estates. In 1766 he was called before the English House of Commons to explain colonial opposition to the Stamp Tax. He returned to Philadelphia when war became inevitable in 1775. Franklin became a member of the second Continental Congress of 1775 and was on the committee to draft the Declaration of Independence, being one of its signers. In 1776 he was sent as one of a committee of three to negotiate a treaty with France. He became immensely popular during his stay which lasted until 1785, during which time he was U.S. minister. In 1781 he was named with Jay and Adams to negotiate peace with Great Britain and returned to Philadelphia in Sept. 1785. From 1785-87 he was president of the Pa. executive council. [H]e received his degrees in St. John’s Lodge of Philadelphia and became active in its work from the very beginning. He was secretary of the lodge from 1735-38; elected junior grand warden of the Grand Lodge of Pennsylvania on June 24, 1732 and the grand master on June 24, 1734. He was appointed provincial grand master (first native born) by Thomas Oxnard, q.v., of Boston on June 10, 1749. He was deposed as provincial grand master by William Allen on March 13, 1750, but immediately appointed deputy grand master. On March 12, 1752 he was named to a committee for building “the Free-Mason’s Lodge” in Philadelphia and on June 24, 1755 took a prominent part in the dedication of the same as the first Masonic building in America. In 1760 he was named provincial grand master of Philadelphia. In 1734 he printed Anderson’s Constitutions as Mason Book, which was the first Masonic book printed in America. In 1759 he was a visitor to Lodge Saint David at Edinburgh, Scotland and on Nov. 17, 1760 was present at the Grand Lodge of England, held at Crown & Anchor, London as “provincial grand master.” An April 7, 1778 he assisted at the initiation of Voltaire, q.v., in the Lodge of the Nine Sisters in Paris, and affiliated with that lodge the same year. On Nov. 28, 1778 he officiated at the Masonic funeral services held by that lodge for Voltaire. On May 21, 1779 we find him elected master of the Lodge of Nine Sisters. He served as master for two years. On July 7, 1782 he was a member of the Respectable Lodge de Saint Jean de Jerusalem and on April 24, 1785 was elected honorary master of the same. He was also elected honorary member of the Loge des Bon Amis of Rouen, France in 1785. d. April 17, 1790. More on Franklin’s Masonic History. The first signer of the Declaration of Independence; first Governor of Massachusetts; Major General of the American Revolution. In 1776 Hancock was commissioned a major general of militia in Massachusets and in August, 1776, he commanded the Mass. troops in the effective Rhode Island expedition. His military leadership, however, was not as outstanding as his abilities in the political field. Hancock nominally commanded 6,000 militiamen in the campaign, although he let the professional soldiers do the planning and issue the orders. His command ended a fiasco. Yet, Hancock went on to be elected the first governor of the commonwealth of Massachusetts in 1780, and served nine terms from 1780-85 and 1787-93, at the time of his death. Hancock went to London in 1760 on business and, while on a similar trip to Quebec, was made a Freemason in Marchants Lodge, No. 277, in 1762. On his return to the colonies, Hancock affiliated with St. Andrew’s Lodge in Boston on October 14. 1762. Interesting to note, Hancock’s name was printed, not signed, on the Dunlap broadside; his signature appearing on a different document—a sheet of parchment that was carefully handwritten sometime after July 19 and signed on August 2. A native of Princeton, New Jersey, Hewes and his family were members of the Society of Friends (Quakers). At the beginning of the Revolution, he abandoned his ties with the Society of Friends and devoted himself to the creation of the new country. In 1776, Hewes was a member of the secret committee on claims, and was, unofficially, the first secretary of the Navy. Having lived in Philadelphia where he was a businessman, Hewes moved to Edenton, North Carolina, in 1763 where he became a a member of the legislature. In 1774, Hewes became a delegate to the Continental Congress and assisted in the preparation of the report on “The Statement of Rights.” Hewes conceived the plan of operations for the ensuing campaign with General Washington for the ensuing conflicts. He was again chosen a delegate to congress in 1776, but illness prevented him from serving. He was again returned to congress in 1779, but died in the second month of his term. Hewes mother lodge is not known, but he is recorded as a visitor at a meeting of Unanimity Lodge No. 7 of Edenton, N.C. on Dec. 27, 1776, just after his return from the Continental Congress. Hewes was as buried with Masonic honors in a funeral that was attended by George Washington, and buried in Christ Church, Philadelphia. A graduate of Harvard in 1760, Hooper studied law under the popular attorney in Boston James Otis, settling in Wilmington, North Carolina. He represented Wilmington in the general assembly of 1773, and in 1774 was elected to the Continental Congress. After the Revolution Hooper returned to his law profession, but fell out of favor with the public because of his political positions. Politically, Hooper supported the Federalist Party because of his political connections, his disdain for the lower class and his soft dealings with Loyalists of Britain. Hooper was a member of Hanover Lodge at Masonboro, which ceased to exist in 1787. Robert Treat Paine was a Massachusetts lawyer and politician, best known as one of the signers of the Declaration of Independence as a representative of Massachusetts. Robert Treat Paine was born in Boston, Mass. on March 11, 1731. Graduate of Harvard in 1749 where he studied theology and law and practicing in Boston. Paine was a delegate to the provincial congress in 1774-75, and the Continental Congress from 1774-78 signing the Declaration of Independence. Paine went on to become speaker of the Massachusetts house of representatives in 1777, and later the attorney general of the state. In 1780 he founded of the American Academy of Arts and Sciences and then going on to become a judge of the supreme court of Massachusetts from 1790-1804. Its believed that he was a member of Massachusetts Lodge, Boston. He was among those present at a Roxbury, Mass. meeting of the grand lodge on June 26, 1759. A graduate of College of New Jersey located in Newark (now Princeton University) in 1748, Stockton was admitted to the bar in the state and earned a reputation in the legal field. He went on to become a member of the state executive council in 1768, and was raised to the supreme court bench of New Jersey in 1774. Prior to signing, Stockton tried first to effect a reconciliation between the colonies and England. Sent to Continental Congress in 1776 by the provincial congress, Stockton was arrested and held prisoner Provost Prison in New York where he was starved and subjected to freezing weather. After being held for five weeks, Stockton’s health was compromised, his property and library pillaged and burned and his fortune eradicated. Stockton was charter master of St. John’s Lodge at Princeton on Dec. 27, 1765, having possibly been made a Mason while in England or Scotland in 1766-67. The public is generally unthankful, and I never will become a Servant of it, till I am convinced that by neglecting my own affairs I am doing more acceptable Service to God and Man. Not only was Walton a signer of the Declaration of Independence and Articles of Confederation, he was also a Revolutionary War officer, a Governor of Georgia, a Chief Justice of Georgia and U.S. Senator. Born in Virginia, Walton moved to Savannah, Georgia, in 1769, where he studied law and was admitted to the bar in 1774. He served as secretary of the Provincial Congress in 1775, as a member of the committee of intelligence, and served as a member of the council of safety in 1775, going on to become president of that body. Served in Continental Congress, 1776-81. He was twice governor of Georgia, 1779 and 1789. He was also twice chief justice from 1795-96. In the war, he was wounded and captured at Savannah as a colonel was held captive for the British army for two years. Born January 14, 1730, in Kittery, Maine, he was the brother of Abraham Whipple, q.v. He commanded a ship before he was 21 and engaged in the European, West India and African trade, bringing many slaves from the latter continent. In 1759 he abandoned the sea and went into business in Portsmouth, New Hampshire, with his brother, Joseph. Whipple went on to be elected a delegate to the Continental Congress from in 1775 and served until 1778, declining his reelection. In 1777, Whipple was commissioned brigadier general and commanded a brigade of state troops at the battles of Saratoga and Stillwater. Following Burgoyne’s surrender, Whipple signed the articles of capitulation on behalf of General Gates. He participated in Sullivan’s expedition to R.I. in 1778 and resigned his commission in 1782, but went on to be the state superintendent of finances from 1782-84. Compiled, in part, from 10,000 Famous Freemasons by William R. Denslow.